A man, 50, was killed at 5.30am on Friday after a tree crushed two cars travelling on the A384 in Devon. Another man lost his life in west Wales after a tree fell on a van at around 10am. One driver had a lucky escape in Belfast on Friday when a tree was blown onto their car. While a tree also fell on a double-decker bus in Dorset, but no injuries were reported. Local media has reported trees and power lines have been ravaged in South Cumbria, leaving more than 6,000 homes without power. Shocking footage circulating the internet has shown pilots being forced to abandon numerous landings across the UK. A video showed a British Airways plane being forced to abandon its initial landing at Heathrow after strong winds put the aircraft off-balance before it touched down. An Aer Lingus flight travelling from London to Dublin Airport was also forced to make an unplanned diversion to Manchester because of the disruptive weather. Meteorologist Alex Burkill said: "It's going to be another very windy one, particularly across northern England, Northern Ireland, southern Scotland and northern Wales. They're going to have very strong winds. "We could therefore see some further problems on roads." As the hurricane strength gales ease off on Saturday evening, some hill snow is forecast in central and southern parts of England and into Wales, Mr Burkill said. "That hill snow will clear through Sunday morning, with blustery showers following behind. Meanwhile, in the north it's going to be a fairly bright day. There will be a few showers perhaps and it could turn windy but not as windy as today by any means." Meteogroup said: "In the morning there will be rain and strong winds in Scotland and a few showers in Northern Ireland, northern England and north Wales. "It will be dry with sunny spells in the south. "In the late afternoon and evening, rain will affect southern parts of England and Wales but northern areas will be mostly dry. Windy." There are currently 44 flood alerts and 3 flood warnings in England. Meteorologist Alex Deakin said: “It’s still going to be wet and windy for a good part of Saturday as the storm system is slow to clear away. “Further problems with wind and rain - rain across the northwest of Scotland especially, combining with snowmelt bringing the potential for flooding. 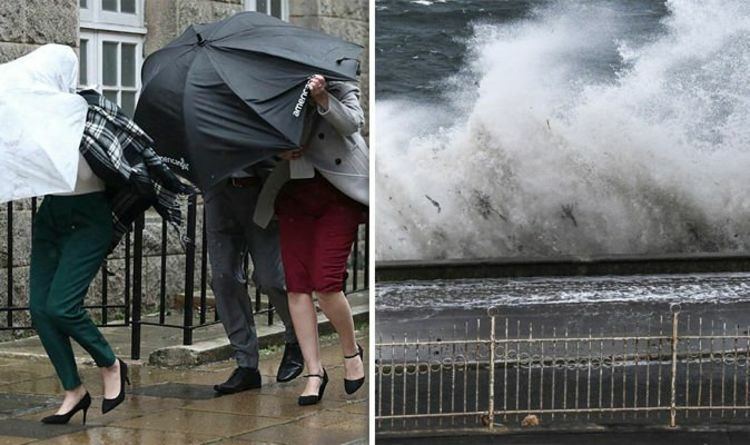 “The wind in this zone across southern Scotland, northern England and Northern Ireland, gusts of 60mph, 60mph over hills and coasts maybe 70mph. Met Office meteorologist Sarah Kent warned the stormy weather will result in some "quite nasty travelling conditions". She said: "It's going to be a noticeably windy day everywhere today. "And that is going to be in association with outbreaks of heavy rain too, so there will be some quite nasty travelling conditions out there this morning."